Hello you crafty people! I hope you have all had a good week and are now enjoying your weekend :-). Saturday’s in our house are usually taken up with the children’s homework, footy training for my Son and any chores that need doing around the place. I think I must have forgotten to do something today as I seem to have some free time this afternoon which is why this post is a day early!!! 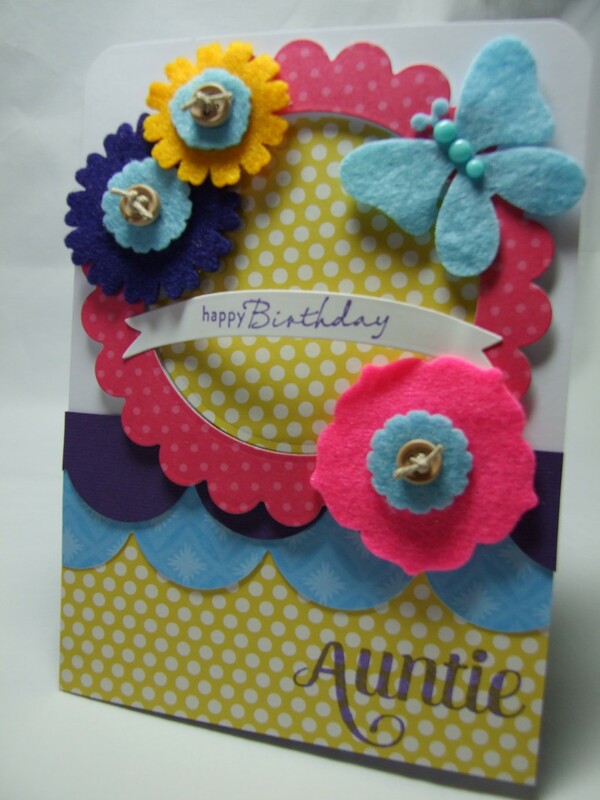 Today I’m sharing a card that I have made for my Auntie’s birthday in May – yes May! I’m really trying to work a month or so in advance for cards that I know I will need, so further down the line I can start to make my Christmas cards (sorry!) early!! So, ‘Fabulous Felt’. There are many gorgeous embellishments out there that we can buy or make ourselves and flowers are up there with the most popular I think. 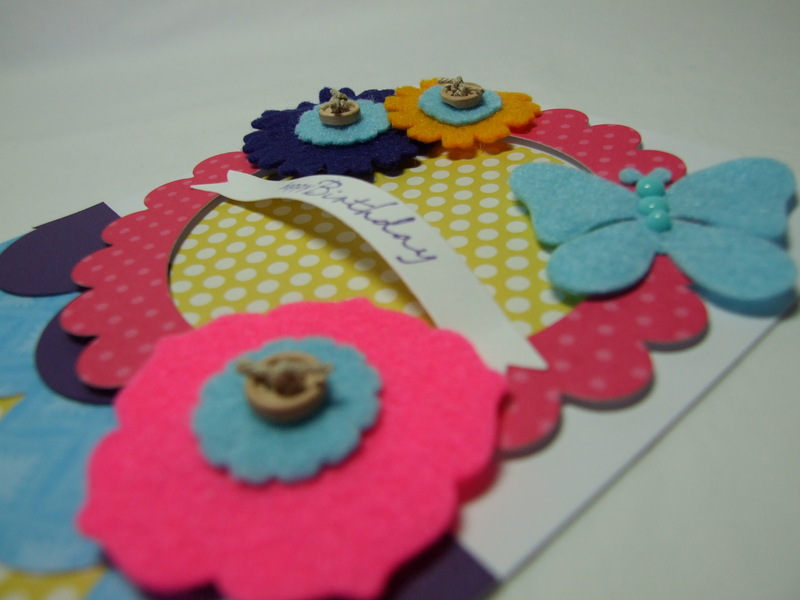 I love felt flowers – whether it’s on a card or a sewing project. There are so many beautiful colours available and basic craft felt is inexpensive to buy so making your own is much more economical. Whilst looking through some of my material I found some pieces of felt, which then gave me the idea for this card. Another great thing about felt is that it die-cuts so cleanly. I have used a die set available from http://www.waltzingmousestamps.com called ‘Funky Flowers’ and these have cut through the felt brilliantly. I particularly like the little butterfly which is a Spellbinders die, and was especially pleased to find that I had some epoxy dots the same colour to pop down the middle! I have used foam pads on the scalloped border to give some more dimension and added some twine to the tiny buttons. Overall I’m happy how this card turned out – a bright, cheery card which hopefully my Auntie will like too! Thanks for looking and have a good week-to-come – Karen. Also used:’Compact Family’ and’Frame it’ stamps from Waltzingmouse Stamps, Spellbinders banner die and scalloped circle die, papers from DCWV ‘Blossoms and Butterflies’ and My Mind’s Eye ‘Oxford Lane’, Sizzix Scalloped border die and WRMK Corner Chomper. Beautiful colors! Such a pretty card! Such a beautiful card! I bet your Aunt will love it! Felt is so fun to work with! And so smart to work ahead! I am trying to do the same this year!